Depression, anxiety, sadness, everyday stress can cause us physical and emotional effects and make use lose our motivation and will. If you want to improve your well-being anywhere you are and anytime, we have an app for you called LightExistence. It will always be available for you in your pocket, ready to motivate and inspire you. 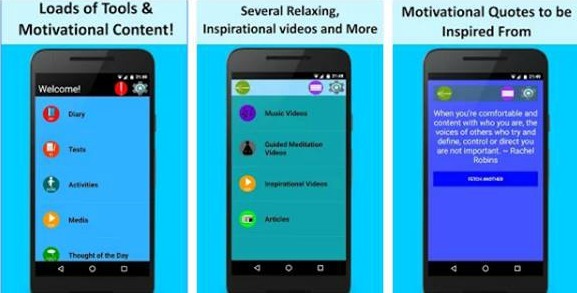 Brought to all of the Android users by Dynames Productions, the app features tons of unique characteristics that can become a helpful part of you treatment and help you look the world around you in a better way. Express your feelings and write down anything you like in the dairy and see what kind of a depression you’re experiencing with the tests this app offers. You can also record the activities that enhance your mood or motivate yourself with multiple motivational, meditation and music videos. To better understand the depression and everything about it, you can read the informational articles that offer many tips and facts. Inspire yourself and bring back the passion in your life with the app’s inspirational quotes and thought of the day. You can find it and download it for free, with no ads and in-app purchases, from Google Play.